On a glum, gray day in Pittsburgh, Dr. Bennet Omalu was tasked with performing yet another autopsy. It was a routine, nondescript course of events. That was until he sliced through the cranium of late NFL center Mike Webster. Dr. Omalu subsequently spent days and weeks exploring the intricacies of Webster’s brain, trying to uncover what had caused the decorated superstar and fifteen-season veteran to lose everything and why he slept in the back of his decrepit truck, super-glued his crooked teeth together and why he could only sleep if he tasered himself unconscious. Omalu searched and searched and then he had the eureka moment, one that would bring the NFL eventually to a kneeling position and one that would make it onto the silver screen, with Omalu being played by Will Smith in the lead in the movie titled Concussion. What Omalu had finally seen was a sludge-like substance, tau protein, that had been overwhelming Webster’s brain cells. It had caused him to be impulsive and irrational, paranoid and depressed, and it had resulted in years of heartache, pain, and confusion until his death at the age of fifty. 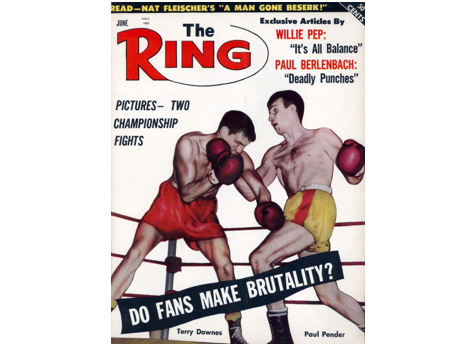 Rose Pender, widow of middleweight champion Paul Pender, had donated her husband’s brain to Boston University hoping for answers as to why, at around fifty years old, things had begun to drastically change for him. The difference in the cases is what happened next in both sports. The NFL, after an initial denial that Webster’s condition—CTE (chronic traumatic encephalopathy)—had been caused by an accumulation of hits to the head through his career, rallied in many ways. They changed protocols, including return-to-play policies, and they invested in research. Boxing, however, shrugged its shoulders and went on about its own business. Perhaps the NFL was forced to change by staring down the barrel of hundreds of lawsuits but change it did. Boxing plowed on, lurching from one pay-per-view to the next, launching new platforms to operate on and crowning new box office stars while many other fighters struggled in retirement with no pension, no unions, and no help—their brains clogged by tau, which can only be detected in an autopsy. There was no NFL to go to for answers, no payouts, no admission of guilt or error. There was nothing. Yet this was boxing’s problem, in every way. CTE was formerly known as “dementia pugilistica,” and before that, it was crudely called “punch-drunk syndrome.” Dr. Harrison Martland, a Newark pathologist, first medically coined that phrase in his seminal 1928 paper in which he described multiple cases of ex-fighters showing signs of wear and tear from the ring, be it slurred speech, erratic behavior, or short-term memory loss. Dr. McKee described her discovery as a “wow moment,” when she found the infestation in Pender’s brain. And while boxing stood still, Dr. McKee went to work—and so, too, did Felice Leeds, who has produced the documentary Unforgotten: The Story of Paul Pender, a hard-hitting film that picked up several awards and is now available digitally with a new title The Brain of a Boxer. Of course, the film’s central narrative is the former middleweight king from Brookline, Massachusetts, and not just his injuries. Unforgotten looks at Pender’s life and times, discusses his career in the fire service, his spell in the marines, lingering problems with his fragile hands, his fights, his boxing life, and his associates, who in the 1950s “red light district of sports” were, shall we say, not whiter than white. His manager, Johnny Buckley, for instance, knew all the right people. And Pender wound up beating the great Sugar Ray Robinson for the title, made a couple of defenses of the belt (once against Robinson in a rematch), lost it to the “Paddington Express” Terry Downes and then won it back from the English battler. Then, a month to the day after reclaiming the prize, he called it quits. You can insert here any number of clichés. He wanted to retire before it was too late. . . . He wanted to retire while he could still count the money he’d made. . . . He wanted to retire before boxing retired him. . . .
Well, it turns out the sport had already done its worst. He had boxed forty-eight times as a professional and was just thirty-two years old. He had ended twenty of his forty wins early, been stopped just three times in six defeats and he had fought 343 rounds. That is not a huge amount of boxing, but it was more than enough for Paul. The decay became clearly apparent at the age of fifty but some, including documentary producer Leeds, believe Pender may have had CTE symptoms years earlier, maybe even when he was still fighting. Because Pender was an unusual sort. He was a terrific boxer and a brave man. He was one of the few bold enough to speak out about Mafia control and corruption in the sport, although he later made a public U-turn with his claims, possibly having faced the prospect of being taken on “a gangland ride” from which he would not have returned. Leeds believes that is just one example of the irrational behavior and clouded judgment that CTE can trigger. Interestingly, Dr. McKee thought Pender may have suffered from high school football concussions that could have determined his future well-being. Boxing, of course, would not have helped. It was Pender’s short-term memory that most obviously faltered first. In retirement, he worked in the Boston education system and then as a clerk in the courts, but his abilities of recollection deteriorated starkly. Then he would become frustrated and short-tempered. Felice Leeds is Paul Pender’s cousin once removed (Pender was her dad’s first cousin) and she was watching the film The Fighter, the biopic of another Massachusetts warrior, Micky Ward, when she decided to find out more. She phoned Rose at a later date and was put in touch with the curator of the Boston Sports Museum and things rocketed from there. Rose felt there should be more recognition for Paul, who had spent the last eighteen months of his life at the Bedford Veterans Hospital before passing away on January 12, 2003. She believed that her husband, who had been referred to as a forgettable champion, should not be forgotten, although she did not realize that it was his brain rather than his boxing that would make him so unforgettable. His brain would become an index case at Boston University, one that categorically informed the world of the perils of the sport and the long-term damage it can cause. The Pender research should also help families and ex-fighters to understand the illness and assist the sport by acknowledging that CTE is not a taboo subject or one to be ignored—but one to be addressed. Why had the man of Rose Pender’s dreams changed? Why was he unrecognizable from the one she married? Why had she been robbed of growing old with her sweetheart? They had said that for his final fifteen years Pender had been suffering with Alzheimer’s, but had he? Rose needed and wanted answers. In her quest to find out she made a pioneering decision to donate Paul’s brain for research. That is no easy choice. The brain and part of the spinal column are preserved, dissected, and analyzed in microscopic details, and that is where Dr. McKee came into it. “[He had] a tremendous amount of tau protein in the nerve cells in his brain,” said Dr. McKee. So why did Pender get it? He quit the sport at the top, as the champion, and at just thirty-two. He only had forty-eight fights, it’s not like he was a hundred-something-bout veteran. He had not taken a worrisome number of beatings. Being related to the Pender family clearly helped Leeds with her access but by the end of Unforgotten, she had also found the real Paul Pender. “I think that he should be best remembered for his brain and I say that because even before I knew about his brain and his connection to CTE the brain was already weaving itself into the story and that I always felt was chilling,” she says, referring to the fighter being well-read, articulate, and intelligent. “Ann McKee’s story and Dr. Omalu’s story were really happening simultaneously and that’s kind of interesting, too.” It is, but football started to take responsibility for something boxing largely continues to ignore. Dr. Charles Bernick is running the largest ever fighter study in Las Vegas at the Cleveland Clinic, performing cognitive tests on active and retired fighters, but away from Vegas and Boston—and certainly within the sport it’s not as widely addressed as it should be. As Dr. McKee slid particles of Paul Pender’s brain under the microscope she started to learn both about the man and the sport. Now would be a good time for the sport to put the illness under the microscope and start helping those and their loved ones—the fighters—who have been affected and traumatized by it. Tris Dixon is the former editor of Boxing News and now presents No Filter Boxing on BT Sport. He wrote about his first fight in 1996 and has since covered thousands of events in more than a dozen countries and on several continents. 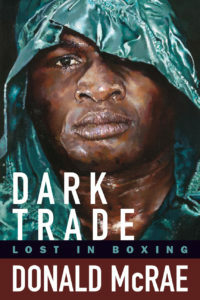 He has authored three books about boxing, including The Road to Nowhere, Money: The life and fast times of Floyd Mayweather, and he ghostwrote War and Peace with UK boxing idol Ricky Hatton. He is also the host of the Boxing Life Stories podcast.